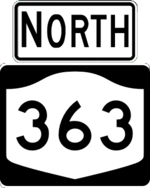 NY 363 is a short freeway that forms part of the Brandywine Highway (the remainder being part of NY 7). 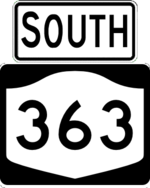 Constructed in 1968, the portion of the highway connecting NY 434 to NY 7 was initially not numbered and wasn't designated as NY 363 until 1981. The freeway is currently being studied for possible removal, particularly south of US 11.